Zoho is a very cool-and free-alternative to Microsoft Office. Known as "cloud" computing because it's totally Web-based, Zoho provides 18 different applications to help you write documents, create spreadsheets, send e-mail, and much more. People love it, but what it doesn't offer are extensive help files, so that's where this practical book comes in. 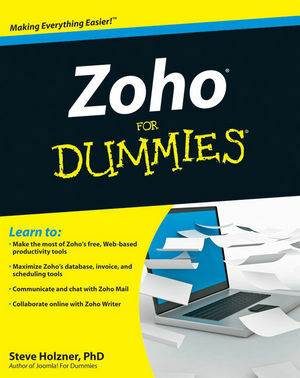 Zoho For Dummies shows you how to use Zoho's most widely used applications, including Zoho Writer, Zoho Notebook, Zoho Show, Zoho Sheet, Zoho DB, Zoho Mail, Zoho Planner, Zoho CRM, and Zoho Projects. You'll get thoroughly up to speed on all common tasks and discover enough tips and tricks to get you power-using Zoho in no time. Get your head in the clouds with this friendly guide to the exciting new Zoho "cloud" alternative to Microsoft Office. Steve Holzner, PhD, is the award-winning author of 112 books, including Joomla! For Dummies and Physics For Dummies. He also teaches programming classes and has consulted for Fortune 100 companies in the area of content management. Steve has been a faculty member at Cornell University and MIT.